Pamela holds a bachelor’s degree in art history from Hamilton College and is currently working on a master’s degree in museum studies at Harvard University. 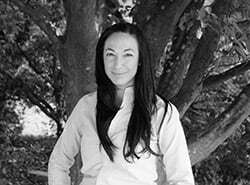 She joined Grace Farms Foundation in August 2015 and currently serves as the Arts Initiative Curator. Previously Pamela held positions at institutions including: The Aldrich Contemporary Art Museum, Christie’s, the Yale University Art Gallery, The Museum of Modern Art, and the Smithsonian American Art Museum’s Renwick Gallery.